The Saskatchewan Legislative Building in the City of Regina towers over the Queen Elizabeth II Gardens and the equestrian statue of Queen Elizabeth II. As the lighting at dusk takes over the sky, the lights in the park, on the Legislative Building and around the area become illuminated showing off the architecture on this historic building. Dating back to 1908 when construction began on the Legislative Building, the "Beaux Arts" style of architecture is stunning as the dusk lights come on. A building which took 4 years to build with a total cost reaching 1.75 million, still houses the seat of Legislative Assembly of Saskatchewan. The flower beds which blossom in an array of color in the foreground, are a beautiful place for a romantic stroll during the hours at dusk. Spring and summer evenings are the ideal time to visit the gardens and watch the lights outline the beauty of the building. Picture of the dusk lights surrounding the Saskatchewan Legislative Building in Regina City. 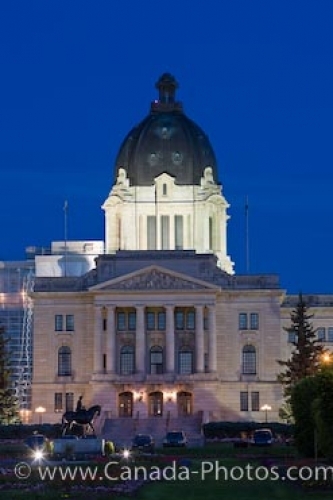 The Legislative Building is one of the most prominent and important landmarks in Regina City, Saskatchewan with the dome reaching a height of 53 metres. Tours are available for those who want to explore the interior of the building along with a touch screen presentation. Legislative Building at dusk in the City of Regina, Saskatchewan, Canada.